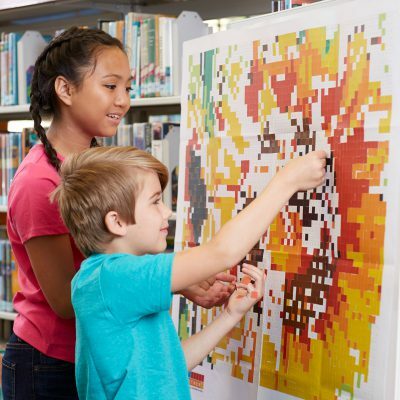 You want to provide your patrons with engaging programming that will pique their interest and inspire them to return to the library again and again. But, let’s face it — sometimes budget and time constraints prevent your awesome ideas from ever seeing the light of day. After all, it’s likely you don’t have much time (or staff) to spare, and there might not be much left in your budget to bring in presenters or buy supplies. It can also be a challenge to get patrons in the library at a specific time and date. So what can you do? Passive programming can be just as effective, not to mention much more economical, and requires very little time commitment. Because these programs are unsupervised and available during all library hours, patrons can discover them while they are perusing the library on their own schedules. Read on for some creative, cost-effective ways to capture your patrons’ interest that require minimal effort on your part. 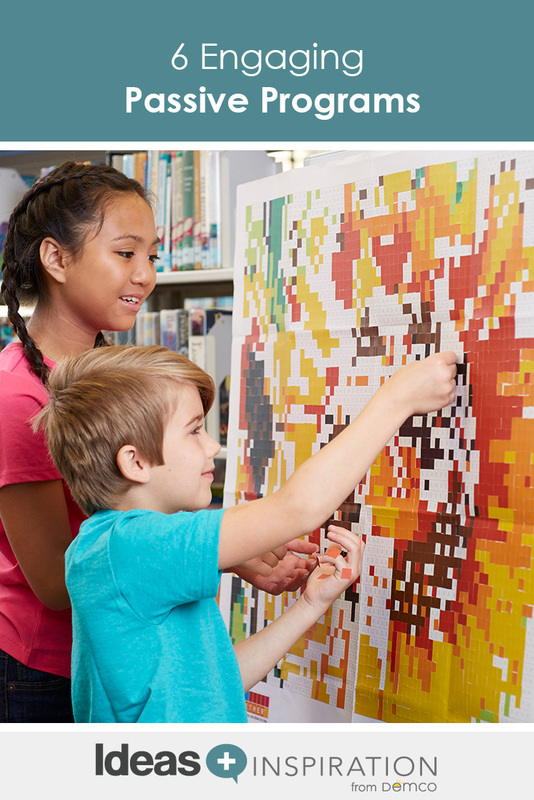 This fun, collaborative activity is perfect for patrons of all ages. Display the poster grid on a wall or bulletin board and place the color key and colored stickers nearby, along with the instructions. Patrons can add stickers to the poster at their leisure. When completed, the result is a beautiful mosaic made out of stickers. Coloring is not just for kids anymore! Adult coloring has become immensely popular, making coloring the perfect intergenerational activity for your library. 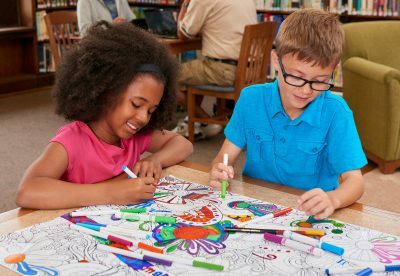 Set up a coloring corner and provide supplies for all ages, including adult and children’s coloring pages, markers, colored pencils and crayons. Check out Upstart’s line of Color Craze resources for bookmarks, stickers, coloring sheets and more to add to your selection. Question of the Week Bulletin Board: On a bulletin board, ask patrons a book- or library-related question. Provide colorful sticky notes for patrons to display their answers on the board. What book character would you love to have dinner with? What is your favorite childhood memory from the library? Book Spine Poetry: Leave a selection of books out on a table, along with instructions for book spine poetry. Challenge patrons to create their own poems with the books! Encourage them to take pictures of their poems and tag your library’s social media. Favorite Places to Read: Title a bulletin board “Where Do YOU Like to Read?” Have patrons post snapshots of their favorite reading spots. Encourage participation by offering a prize (such as a gift certificate for a local business) for the most unique reading spot. Blind Book Display: Set up a display of books that are wrapped in decorative paper so that patrons can’t see the titles. Depending on the time of year, you might title the display “Book a Blind Date!” (Valentine’s Day), “Are You Feeling Lucky?” (St. Patrick’s Day), “A Book Is a Gift You Can Open Again and Again” (December), or simply “It’s a Mystery!” Your checkout system may be able to read the bar code through the wrapping, allowing patrons to leave the book unwrapped until they get home. A Sense of Community: On a bulletin board, ask patrons what additions they would like to see in your community. Invite them to post their suggestions on sticky notes on the board. Share any popular ideas with your local chamber of commerce or city council. Vote for Favorites: Set up a display of books according to a theme (books that have been made into movies, suspenseful books, stories about animals, etc.). Provide note paper and a decorated box, and have patrons vote on their favorite book from that category. Display the results after a set period of time. Timely Trivia: Create a bulletin board titled “Did You Know?” with questions about timely events, such as the anniversary of the sinking of the Titanic. Post trivia questions about the event on the front of folded pieces of paper. Write the answers on the inside of the fold so patrons can lift the flap to see the answers. 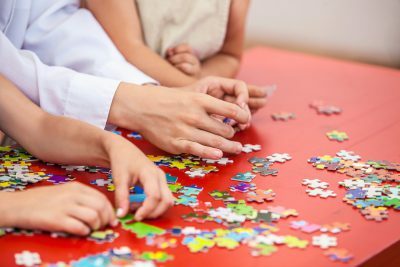 Old-fashioned puzzles and board games are a great way to get patrons to spend more time in the library. Put a puzzle out on a table along with a sign inviting patrons to jump in and work on the puzzle. Another idea is to create a game corner in the library. Display a couple of board games on tables, along with the instructions, and provide several more games on a shelf nearby. Be sure to provide games for a range of ages, such as Candy Land, Guess Who?, Apples to Apples, checkers, chess and Monopoly. Next to a sign inviting patrons to make their own bookmarks, set out craft sticks, markers and/or paint, glue and decorations such as stick-on googly eyes, small stickers, beads, small pompoms, scrapbook paper, etc. Partner with your state’s tourism office to provide brochures, maps, guide books and more as part of a display titled, “Where’s Your Favorite Place in Our State?” Have patrons post pictures or post sticky notes of their favorite places to visit, and create a display of travel books relating to your state. For more great passive programming ideas, check out Demco’s Passive Programming Pinterest Board.